Here's a game guide and depth chart for the Food Paradise area to help you catch all trophies found in the action and arcade slashing game - Ninja Fishing, available on Android - Google Play and iOS - App Store. 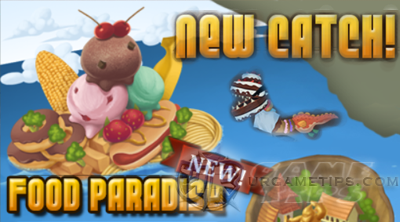 Enjoy the brand new island - Food Paradise with new foodie fish to catch and floating Restaurant boat with lots of treasures! - Ending Range (m): Estimated "Last Seen"
- Event or Limited Time Fish Species not included. - Red Labeled Fishes are Uncommon or Rare! How to Open Food Paradise? - You need to either have 10 buildings in Ninja Village or a Floating Restaurant boat (100,000 Gold) to enter!